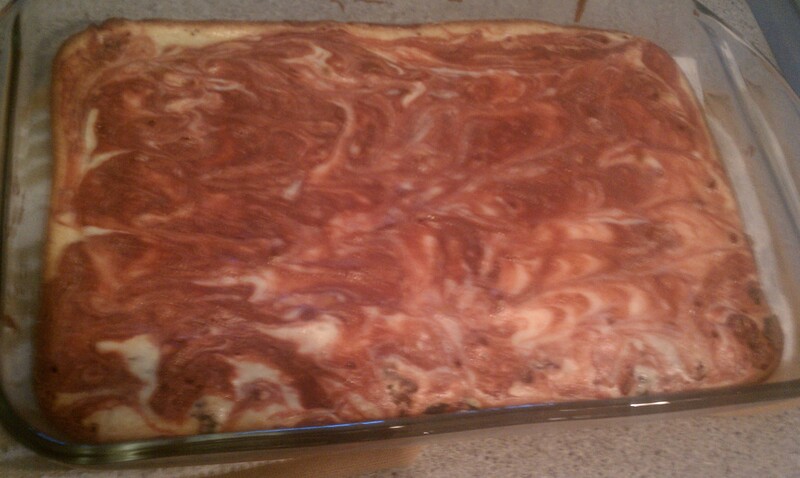 Ok – so i had a really big oreo craving, and cheesecake…. 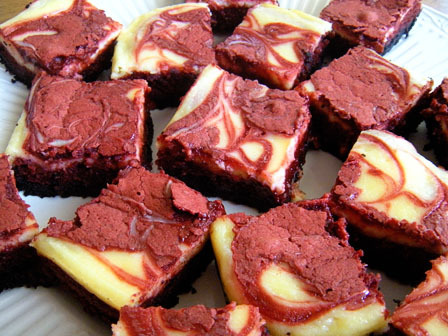 and red velvet – uhhh………… ok my sweet tooth is on an all time high – and after my crumb cake flop last week I found this recipe for these brownies. It was a super rough week with interviews and being that its friday I wanted to make something that would be a good sweet end to my week. Preheat the oven to 350 degrees F. Line an 8 by 8-inch baking pan with tin foil; spray the foil with baking or nonstick cooking spray and set aside. Crust: In a small bowl, mix together crushed cookie crumbs with melted butter until combined; press into the bottom of the prepared pan. 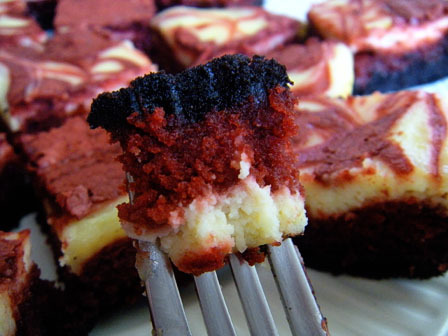 Brownie layer: In the microwave, melt the butter. Pour the butter into a large bowl and add the sugar, vanilla, cocoa powder, salt, food coloring, and vinegar, in that order, whisking together between additions. In a small bowl, beat the eggs lightly with a fork and fold them into the cocoa mix. Fold in the flour until lightly combined. Pour the batter into the prepared baking pan, saving ¼ cup of the batter for the top. Cream cheese layer: In a medium bowl or in the bowl of a stand mixer, beat together the cream cheese, sugar, egg, and vanilla. Remember to scrape down the edges of the bowl frequently to fully incorporate the cream cheese. Gently spread the cream cheese layer on top of the brownie batter in the pan – I find that an offset (icing) spatula works well for this step. Dollop the remaining brownie batter over the cream cheese layer. Using a skewer or the tip of a knife, drag the tip through the cream cheese mixture to create a swirl pattern, being careful not to disturb the Oreo layer. Please try this recipe! its so easy and i can’t get over it!